Vietnamese suspect Doan Thi Huong, second from right, in the ongoing assassination investigation, is escorted by police officers out from Sepang court in Sepang, Malaysia on March 1, 2017. Malaysia charged two women with murder Wednesday in connection with the death of Kim Jong Nam, the half-brother of North Korean leader Kim Jong Un. Siti Aisyah, a 25-year-old Indonesian, and 28-year-old Doan Thi Huong from Vietnam were under heavy security as they appeared at a Kuala Lumpur court. The women were not asked to enter pleas in the case, but have said they are innocent, and believed they were taking part in a prank for a television show. They each face the death penalty if convicted. They are accused of being the two women shown on security camera footage smearing something on Kim Jong Nam's face at an airport in Kuala Lumpur last month. He died 20 minutes later from what authorities say was the effects of the powerful VX nerve agent. Prosecutors want to try the two women together, and the pair is due back in court in mid-April. They wore bulletproof vests as they were escorted from the court back to prison. The court on Wednesday also issued a gag order meant to prevent police and potential witnesses from making public statements about the case. North Korea has not confirmed that the dead man is Kim Jong Nam, and is demanding that Malaysia release the body, as well as a North Korean suspect who is in custody. Malaysian authorities have not said what connection the North Korean man may have to the killing, or whether he will be charged. Kim Jong Nam was the older estranged brother of Kim Jong Un. 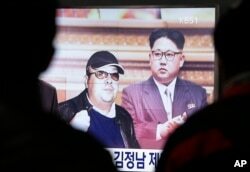 Kim Jong Nam was once considered the heir apparent to lead North Korea, but he fell out of favor with their father, the late dictator Kim Jong Il, after a failed 2001 attempt to enter Japan on a forged passport to visit Disneyland. Since then, Kim Jong Nam had lived in virtual exile, primarily in the Chinese territory of Macau.